Community Acupuncture at Chicago's Alternative Health Group offers highly effective acupuncture at an affordable price. 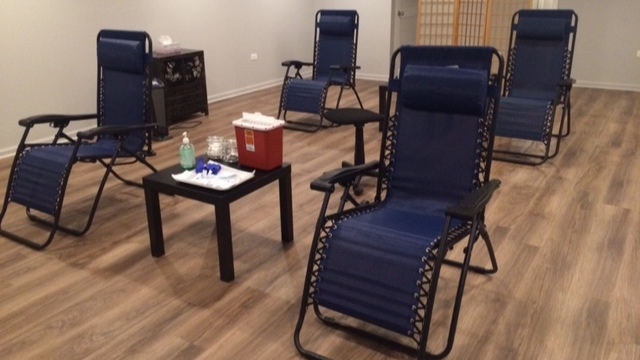 Acupuncture treatments are given in a community room alongside others in comfortable zero gravity chairs. You will receive a thorough consultation followed by plenty of time for rest, relaxation and healing. Soothing music and white noise machines offer a semi-private environment. Needles are placed in points along the arms and legs and if indicated, the head and abdomen. This is a shared space and we do our best to protect our patients’ privacy. Loose and comfortable clothing is recommended for easy access to arms and legs. Allow an hour for initial treatments and 45 minutes to an hour for follow-up treatments. Currently we are offering Community Acupuncture only at our Wicker Park Location. Call us today for questions or to book an appointment. Walk ins welcome.